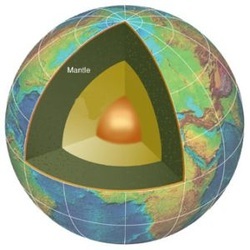 The Mantle is the second layer of the Earth. It is the biggest and takes up 84 percent of the Earth. In this section you will learn and more about how hot the mantle is, what it is made of, and some interesting facts about the Mantle. The mantle is divided into two sections. The Asthenosphere, the bottom layer of the mantle made of plastic like fluid and The Lithosphere the top part of the mantle made of a cold dense rock. The mantle is composed of silicates of iron and magnesium, sulphides and oxides of silicon and magnesium. The mantle is about 2900 km thick. It is the largest layer of the Earth, taking up 84% of the Earth. Convection currents happen inside the mantle and are caused by the continuous circular motion of rocks in the lithosphere being pushed down by hot molasses liquid from the asthenosphere. The rocks then melt and float up as molasses liquid because it is less dense and the rocks float down because it is more dense.